Photo Credit: funkeemunkeeland via Compfight CC-BY-NC-SA. It has become a daily bet, a cruel, painful, and unfair bet. Every day Puerto Rico wakes to a sort of Russian roulette, trying to determine which child, pensioner, or ward of the state is about to be left out in the cold in what has become a constant―and potentially deadly―balancing act, as officials try to manage the commonwealth’s dwindling and unpredictable cash flow while attempting to maintain basic public services. Since 2016 began, this forlorn island territory has been besieged by fiscal problems. In the second week of January, the Puerto Rican government’s gasoline suppliers threatened to suspend service due to lack of payment. Ambulances and vehicles used by social workers (fundamental in a society plagued by child abuse and gender violence) were in danger of coming to a standstill. The government managed to make partial payments, but then faced a similar prospect with special education children, who were suddenly confronted with the possibility of losing therapies. They were spared by a last-minute scramble that produced payments big enough to keep services running―but not big enough to put accounts in the black. These budget dramas play out daily while debt-ridden Puerto Rico awaits action by the U.S. Congress. Strapped with over US$70 billion in debt, Puerto Rico is spending more on debt service than on education, health, or security. Services are being curtailed as public agencies scramble to cut costs. The Autoridad Metropolitana de Autobuses, which is in charge of public transport in San Juan, announced a drastic reduction in routes “to increase efficiency.” The pediatric hospital increasingly depends on charitable donations from NGOs for repairs to its infrastructure as well as for some professional services. The island needs urgent access to some mechanism of debt restructuring. 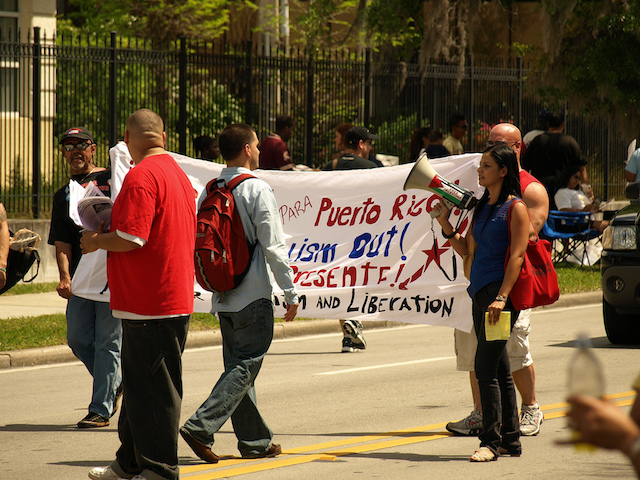 In 1984, Puerto Rico was excluded from the Chapter 9 provision of the U.S. Bankruptcy Code. Neither a U.S. state nor a sovereign one, Puerto Rico lives in limbo, incapable of either seeking debt restructuring under the U.S. legal system or seeking international debt relief. The Obama administration has called on Congress to approve Chapter 9 provisions for the island, but despite a series of seven congressional hearings, no action has been taken on Capitol Hill. This crippling climate of uncertainty has forced the government to choose between paying creditors or providing public services. Puerto Rico paid its “general obligation” debt service this January after taking extraordinary emergency measures, including borrowing $400 million from its own state insurance companies and workers’ compensation funds; deferring 2014 refunds to taxpayers; and postponing payments to service suppliers. Accounts payable are estimated to have increased to a whopping $1.8 billion. Despite all this painful juggling, two of the commonwealth debt issuers, the Puerto Rico Infrastructure Financing Authority and the Puerto Rico Public Finance Authority, have already defaulted on $100.8 million in debt-service payments. And two insurers of Puerto Rico–issued debt have sued the government in the U.S. federal court in San Juan. Lacking the clear procedures that Chapter 9 bankruptcy protections would provide, retail mom-and-pop investors (both in San Juan and on the mainland) will probably lack the resources, stamina, and time horizon to brave what is expected to be a protracted series of creditor lawsuits. While Congress wavers, this past week the island’s 12,000 incarcerated people were close to being left without food due to lack of payment to the service providers. A last-minute check averted disaster. Inmates on the island tend to be young, poor, and jobless, coming from rural barrios with a high school education or less. As the situation continues to deteriorate, one wonders, how many of the most vulnerable puertorriqueños will continue to be held hostage to the island’s debt-restructuring limbo? Jennifer Wolff wrote this piece for Open Society Foundations. Ms. Wolff is senior program director at the Center for a New Economy in Puerto Rico.